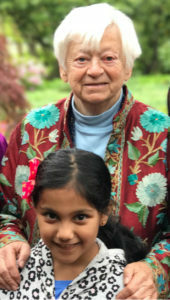 This #NationalAuthorsDay, we’re celebrating NYF’s youngest and most senior authors: Karuna and Olga. Eight year old Karuna wrote The Animal Adventure for her seven year old cousin. Upon learning of the heartbreaking situation of flood victims in southern Nepal, she asked her parents to help her print the book and sell copies to raise funds for these communities. In September, she presented a $1,375 check to NYF-Nepal Executive Director Raju Dhamala. 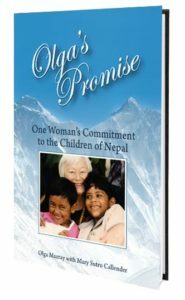 In 2015, at age 90, NYF Founder Olga Murray, along with Mary Callender, published Olga’s Promise: One Woman’s Commitment to the Children of Nepal (available here). The book is inspiring proof that it is never too late to make a difference in the world. Allende has not had the opportunity to read Karuna’s book yet, but we’re certain she’d be equally impressed! Please support NYF’s favorite authors and their commitment to improving the lives of Nepali children by making a donation in their honor.